The race is now well underway. The last of five vultures to leave its summering area was Argentina, who started moving on 20 April and already has migrated 574 kilometers north. Our lead bird, Domingo, has reached central Bolivia, traveling 2114 kilometers to do so. Young Luro who has overwintered in central Bolivia the past two years, is in southern Bolivia, apparently en route to his old wintering area near the center of the country. Whitey, who is traveling along the same route, is now in northern Argentina, having migrated 1361 kilometers in less than a month. Our apparent outlier, La Pampa, is blazing a new trail east of our other migrants, and appears to be headed for Paraguay, having traveled 1476 kilometers in about three weeks of migration. Although the race is far from over, the exciting news is that Hawk Mountain scientists are now tracking the movements of five individual vultures, all of whom appear to be participating in a “mirror image” of the migratory movements taken by East Coast vultures in North America. The migratory exploits of these five pioneers (no other species of raptors has ever be tracked from breeding areas both north and south of the Equator) are helping us learn more about the movement ecology of this common and widespread species. Our strategic plans call for continued investigations in hopes of better understanding the biology of this species, which we plan to use as en ecological sentinel for environmental contaminants. You can watch the progress of these and other migrating vultures by following their movements online. Visit www.mountain.org and click on “track migrants online” for details. If you want to become involved in supporting this work, email me at bildstein@hawkmtn.org or call me at 1-610-781-7358. 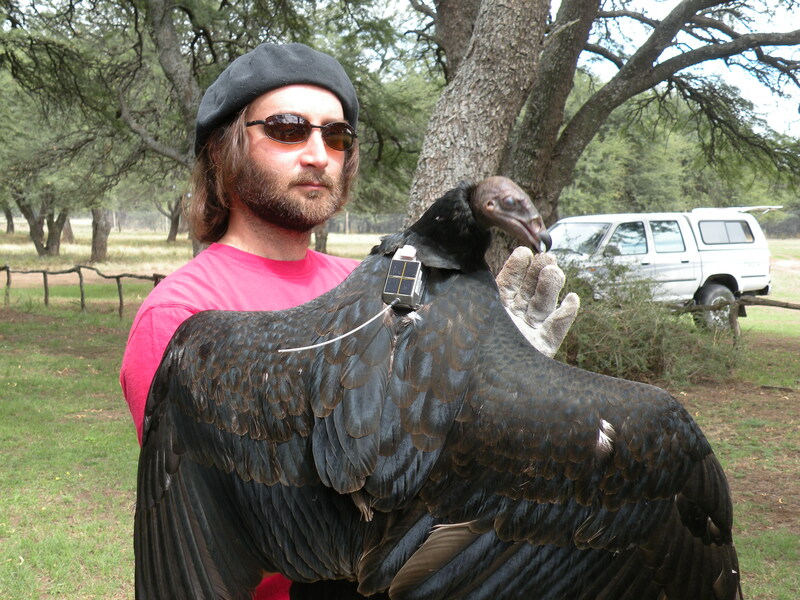 This February Hawk Mountain Research Associates Dr. Jose Sarasola of Argentina and Dr. Marc Bechard of Boise,Idaho, placed tiny satellite-tracking devices on the backs of four Turkey Vultures in southern La Pampa, central Argentina, in hopes of tracking their migrations. In late March-early April two of the birds started migrating north toward their as yet unknown wintering grounds. (Recall that it is now “Autumn” south of the Equator (not Spring), and that birds there travel north toward the equator at this time toward warmer weather. A fifth vulture tagged in March 2009 also is now traveling north. Although it is safe to say that the birds don’t know each other’s locations, most researchers believe that getting to a preferred wintering area first helps migrant’s secure the best sites for their use. Thus in an ecological sense, the birds are, in fact, racing for just the right spots. You can keep track of the movements of all five birds by visiting http://www.hawkmountain.org and clicking on “track migrants online” to follow the birds north. All of our tagged vultures have names. As of April 13, Domingo, who started moving north on April 1, was 649 miles from its starting point. Whitey, who started north on March 26, was 544 miles north of its starting point. Young Luro (the bird we tagged in 2009), who started north on April 5, was 347 miles north of its starting point. Two additional tagged vultures, La Pampa and Argentina have yet to begin their northbound flights. If past is prologue, Young Luro, will overwinter in central Bolivia about 1,500 miles north of its stating point, which is where it overwintered the two previous years. The birds northbound movements are likely to continue into late April or early May. Although I hesitate to handicap this migratory event, The First Great South American Vulture Migration Race now underway and promises to be a “flight to the finish.” Website updates are available on a weekly basis, so visit the race-track often to see if your favorite gets to their wintering grounds first. The site also tracks the movements of several Black Vultures fromArgentina, as well as a number of Turkey Vultures fromCanada and the United States. Hawk Mountain’s long-term goal is to study the movements of these species in various parts of their ranges so that we can better understand their movement ecology and the factors affecting it. There will be more to follow as the race continues. The páramo, a high altitude ecosystem of Central and South America, is not a particularly welcoming place. It is cold and wet and windy. The nights are long, the thunder so explosive the sound alone may kill you. Few people ever visit, and those who do often describe the landscape as “barren” or even “desolate”. Grasses, not trees, dominate the rumpled terrain. From a ridge top, one looks out over an endless vista of tawny mountains and steep-sided valleys. It is a forbidding scene. But this is only the first impression. With time the wonders of the páramo begin to show themselves, like one peak after another coming into the light of the morning sun. 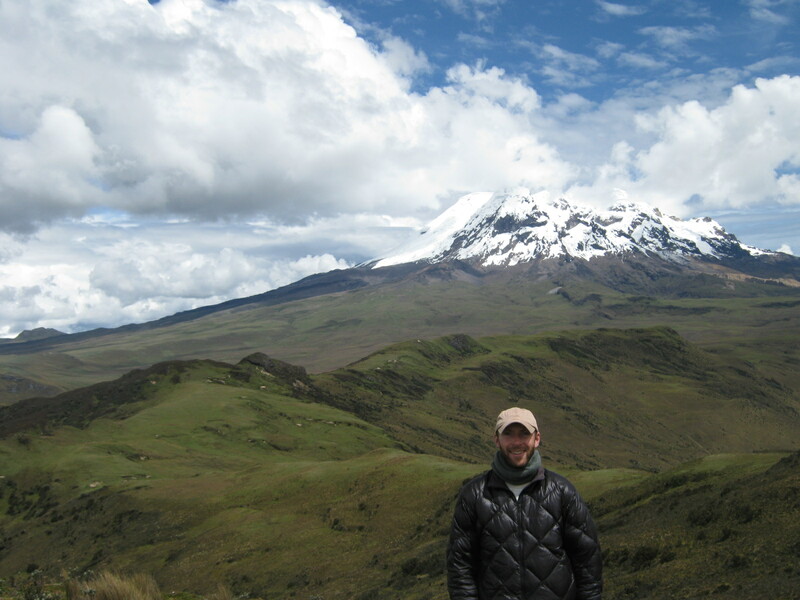 I came to know a little of this mountain world through my work in Ecuador as an Andean Condor field biologist. Here, I share some of my experiences. Like most places, the páramo has its superstars, the Andean Condors, the spectacled bears, the pumas. But it is also home to a host of more diminutive, though no less intriguing, inhabitants. An Ecuadorian Hillstar Hummingbird, for instance, may suddenly show itself, and if the conditions are right, you’ll see a flash of violet light so rich and vibrant you will be momentarily stunned. And then it will be gone. And you’ll be left to wonder whether you should applaud or call out like you would for a fireworks display, or a shooting star. I can recall the few times I glimpsed this living light. The first time I was in among some shrubs, and below a ridgeline. A steady rain had just slowed to an easy stop. The day was gray, though clear. I still had on my rain jacket, and the vegetation was bejeweled in beads of water. There was a purr of wings, and a hummingbird rose up in front of me. The bird’s belly gleamed a snowy white, and the head appeared dark gray. Then, as the head swept from one to the other side, I received a benediction in the form of a shimmering, violet, flaming iridescence. The bird flew away and the purr followed close behind. The rain returned, and the day carried on, more or less, as before. On my trips to the field I was typically accompanied by one or two Ecuadorian park rangers, and sometimes a thesis student. The park rangers were a likable lot: good-natured, good-humored, patient, weathered little brown men, many in their 40s or 50s. I was responsible for all our food on these excursions. Cooked oats, I discovered, could erase the cheer of a ranger like an eclipse the cheer of the sun. After breakfast, however, the rangers’ good humor rarely dimmed. Upon returning from a four day trip, for example, the two rangers with whom I had been travelling informed me, with stone faces, that they had lost one of my tennis shoes. It must have fallen off several miles back when the horse had a scare, they said. For much of the return hike I had been anticipating the moment when I could swap my rubber boots for more comfortable tennis shoes. I was visibly deflated. My thoughts lingered on sweaty feet and the 3-hour bus ride to Quito. As it turned out, the rangers hadn’t lost the shoe. No, they had hidden it behind a bush. 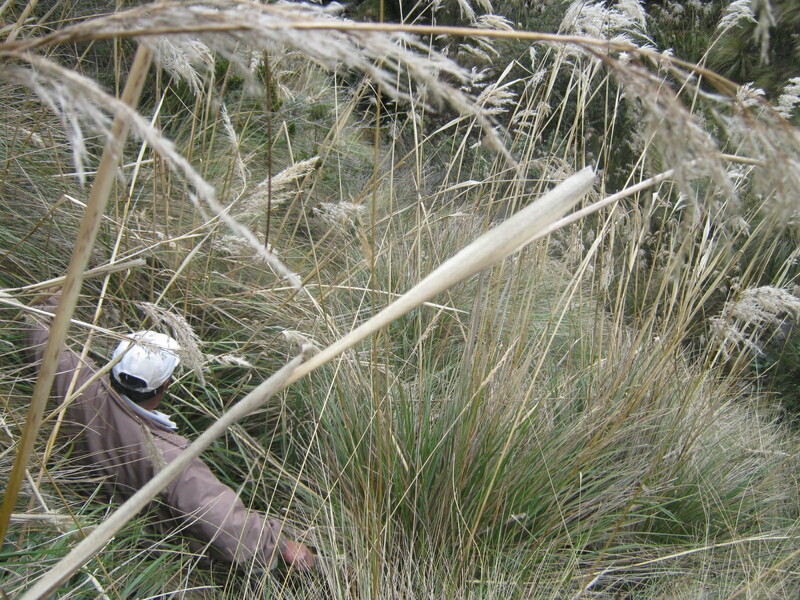 As you walk through the páramo for the first time, you quickly notice there is something wrong with the plants. What is wrong, you realize, is that they exist, though plants like these should not. But, there they are, looking at you with their weird faces. As you crest a hill you are liable to meet a bizarre battalion of columnar plants. At least you are pretty sure they are plants. These are Huperzia crassa, a species of firmoss. They emerge from the ground like fingers – fingers that happen to be neon orange or purple and covered in scales. You notice to your left a couple of … plant ghosts? These melancholy entities, clothed in gowns of fine white hairs, are frailejones. Their leaves are remarkably similar in size, shape, color and texture to white rabbits’ ears. A single long neck often extends out from a central mass of leaves, a rabbit huddle, and ends in a chunky, down-facing yellow flower. With more than half of the paramo’s few thousand plant species found nowhere else on earth, botanical surprises spring up around every bend. 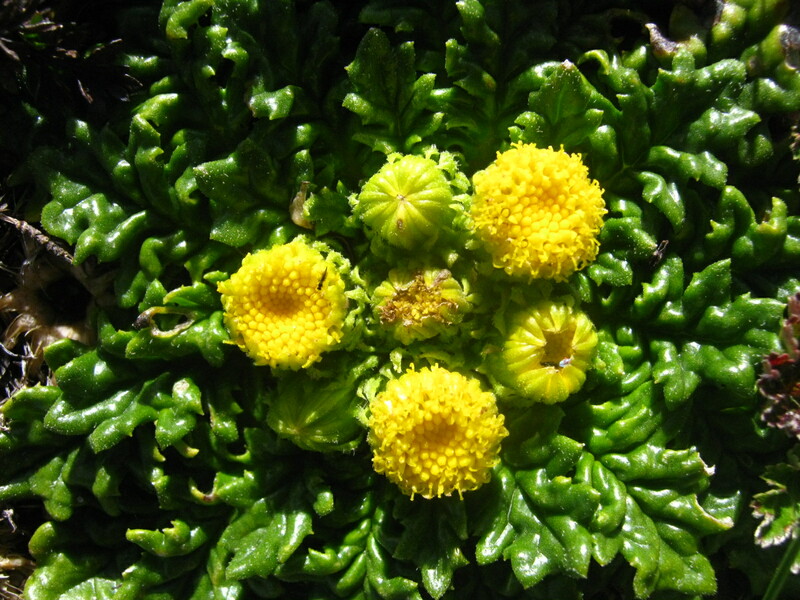 I’ve come across plants resembling lime green molars and diamond-tipped crowns. I once came across a flower that looked like a hard-boiled egg inside an orange inside an apple. Had Dr. Seuss visited the gardens of the páramo, he may have been angered to discover that many of his creations were, in fact, minor variations on real-life forms. Or perhaps he would have felt strangely at home. One of the perks of working in the páramo is the free tea. Sunfo, a common, aromatic plant, makes the best and is often found by the minty scent she releases when you accidentally trod over her. She has tiny, spade-shaped leaves that come in pairs, and elegant white flowers with tasteful splashes of purple. You can find her growing in low mats on hillsides at the base of earthen mounds. Harvesting sunfo is a pleasurable act. You can bring her fresh to your nose for a potent dose of her wonderful aroma. Her scent lingers on your hands for hours. And she parts from the earth with a satisfying sound and feel, like hundreds of fine threads snapping in succession. One day I was harvesting sunfo, and I noticed a tiny insect in the vegetation. 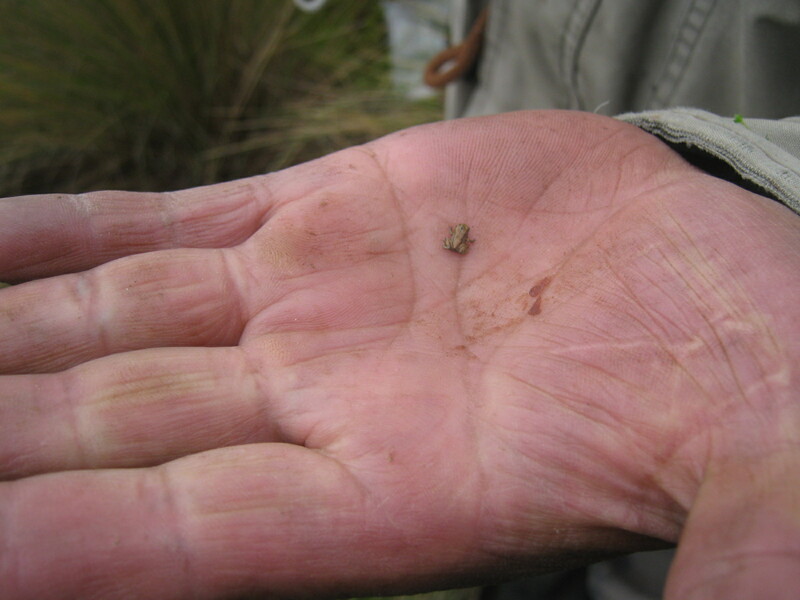 I picked him up, and when I looked closer I saw he was no insect, but the smallest frog I had ever seen! Half the size of a pencil eraser, this progeny of a robber frog emerged from its egg not as a tadpole, but as the copper froglet in my hand. I set him down in a forest of sunfo to play his part in the evolutionary theater, and headed back to camp for a hot beverage. Perhaps my favorite páramo phenomena are the cloudbursts of swifts and swallows. Imagine: you are out for a hike on a bright day. Your eyes are downcast to select your footing on an uneven and partially-obscured game trail. Somewhere in the distance, a mysterious force is building, and heading your way. An indistinct rustling permeates the air. You hop over a muddy section of trail, and continue on your way. Then, the indistinct becomes distinct as you recognize the sound of a wing slicing air. You look up. And the sky is alive with the bustle of birds on the move and the music of their movement. If they are swallows, they will pass as a winter snow flurry, each bird a sapphire snowflake on a tumultuous path. If they are swifts, large sooty birds with white collars, then the flight pattern will be more dispersed and grandiose. The swifts arrive like a disorganized squadron of fighter planes; they are big, they are fast, and the sky belongs to them. The arcs they cut tend toward the sublime. These birds are as mesmerizing as anything wild and free. Pairs, in tight synchrony, scream past, as though love’s outer reaches could be achieved not by climbing to new heights, but by accelerating to new speeds. Before long the flock is in the distance, and then gone, a memory. And you are under an empty sky on a game trail in the mountains on a bright day as a breeze caresses the look on your sun-tanned face. 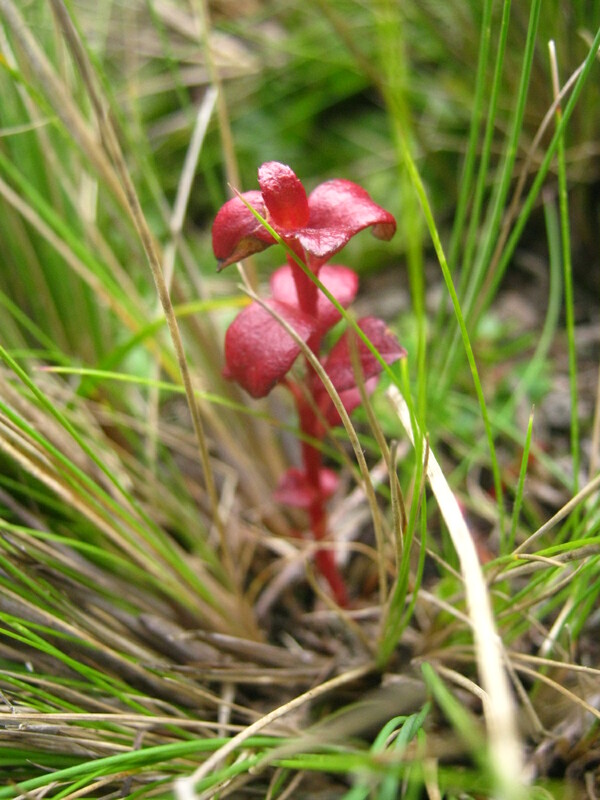 Once, during a leisurely ramble on a rainy afternoon, I happened upon a tiny and unassuming plant the color of sunlit red wine. His leaves were waxy, rounded, and curled. Though pleasant enough in form, there was nothing outwardly spectacular about this plant. The charm for me in this one resides in how we met, and in what this plant signifies. After crossing from one side to the other of a river valley, I began to pull myself up the steep bank by grabbing clumps of grass. As I drew one clump aside like a curtain, there sat this little red plant, staring up at me. In a word, he was adorable, like a baby wild thing out of its nest. And somewhat puzzling: What was he doing beneath this jungle of grass? I’ll probably never know, and I’ll probably never again see this little plant. Nevertheless, he left his mark and has become for me a manifestation of all the beauty in the world that blooms and fades and is never seen. How easily I could have missed him! This humble plant of sunbeams and red wine is a reminder that the world brims with beauty but for the sake of beauty. If you are interested in hearing the mad hum of the life force of the páramo, then you had better head for the water, where the hum reaches its crescendo. In the hills the grass grows up to your knees, or maybe even your waist. But down by the water the grass towers over your head. 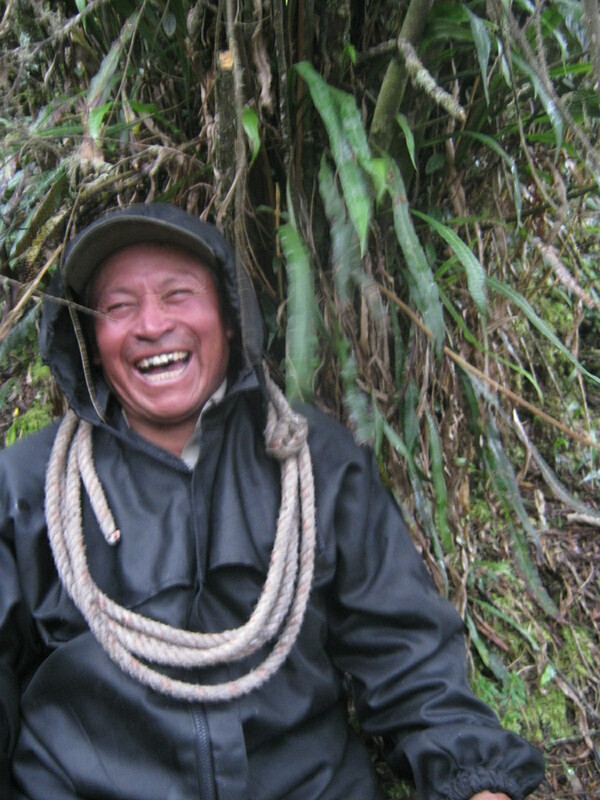 The streams of the paramo are writhing with life and energy as no other place I have seen. To stand on a boulder in the middle of one of these streams and listen, you will first have to descend one of the challenging and steep banks. The vegetation is so thick you feel like an arboreal creature navigating a canopy more than something terrestrial walking the earth. As you slide down to the stream, you enter yet another new world. Plant parts reach out over the stream, providing an incomplete roof of yellow and green beams, flavored water drips from moss on black earthen walls, crystalline water slides over pink and gray rocks on its journey to the ocean. Soft golden tassles, like clouds, hang here and there, and shed snow-like seeds when disturbed. There is so much liquid sound here. Burbles, splashes, plops, and gurgles. And such a profusion of benign green life. The atmosphere is positively charged from the hopes and strivings of thousands upon thousands of life forms. There is a mad, electric hum. The most apathetic person could not maintain his indifference here; there is healing in this place, the type that occurs when one realizes his joys and sorrows are no different from those of all life. On one five-day trip, I was accompanied by a talkative and enthusiastic thesis student named Cindy. Cindy was afraid of everything: cold, mud, lightning (me too for this one), bears, rain, the dark, being alone, you name it. She was a Quito girl, una Quiteña, had done little hiking, and had never camped in remote nature. She replaced a profane word in a common Ecuadorian expression with the fruit “mango.” I was skeptical on how she would fare, but she ended up doing just fine. We began the trip with a soggy half-day hike, a hike we lengthened to accommodate Cindy’s mud fear, through wetlands teeming with flowers. One of the more common flowers was Gentsiana sedifolia, the Flower of Love. 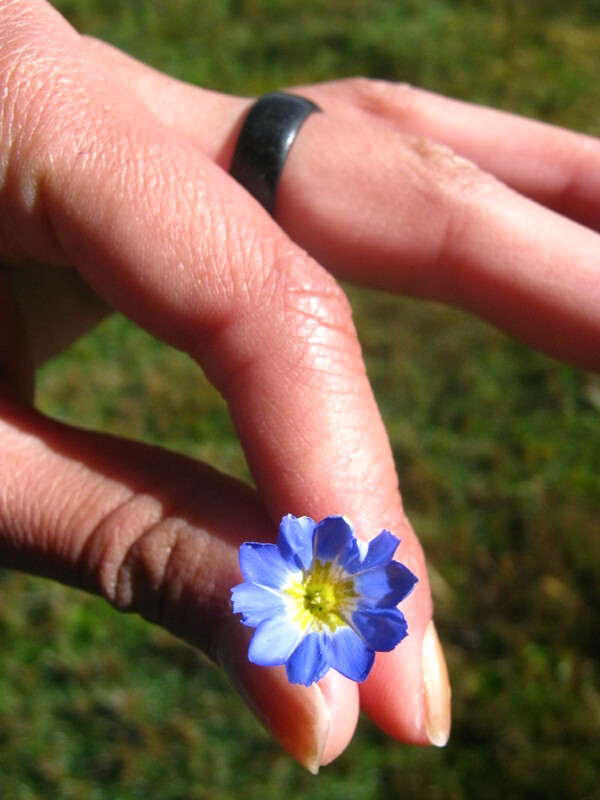 This small blue, white, and yellow flower is, indeed, lovely. When plucked and breathed upon with your true love in mind, this flower reveals, through closing or not, whether or not your true love loves you back. We ascertained the sentiments of our respective loves, and continued on to a patch of earth, between two streams and at the base of three hills, that would become our camp. Each afternoon we walked ridges in search of condors. On breaks, we ate peanuts and prunes and chocolate as changing patterns of light swept the landscape. We saw several Andean condors each day. The birds were typically soaring several miles away and visible as tiny silhouettes. But occasionally an adult, in striking black and white plumage, would drift over us like a god. The condor would bend his head toward us, as if to take our measure, and then return to the divine matters at hand and rise into the clouds and out of sight. We retreated to our tent each afternoon, tired and happy, as the last daylight was fading. At night, frogs made pleasant hollow knocking sounds and joined each other in a chorus with the rhythm of the falling rain. Mysterious birds whistled at one another. Cindy, who would later tell me she had always thought the páramo feo, ugly, sat by the fire and looked out at the irregular, mountainous horizon, dark below, starry above, and said, Que paz, How peaceful, again, and again, and again. Before long Cindy and I nestled into our sleeping bags and said goodnight. Our little tent lay in a cradle under the watch of a crescent moon, miles and miles from anyone and anything. As I started to give in to sleep, someone outside the tent fired up an engine! We shot upright. The engine stopped. We looked at each other. What the hell was that? We listened. Nothing. A few minutes later, having lain down again, the engine roared once more. It sounded like a plane coming in to land, but the sound stopped as abruptly as it came. I listened hard, and could hear a single bird give a descending series of “whit-woot” calls. A bird? The frogs knocked. A bird tooted somewhere. And then the engine and the whit-woots. Then another engine, farther off, followed by a fainter series of whit-woots. I lay back down and wondered what this mystery bird looked like. I thought, sometimes it is nice not to know. Sometimes, it is nice to go to bed with mystery in the air. On one of my final nights in the páramo, I lay in my tent, listening. Two rangers were in a nearby tent having a conversation. I could hear their tones and the melodies of their speech, but I did not catch the words. They spoke comfortably, and sometimes paused between sentences. Above us hung a thick layer of cloud. Farther up, the snow-covered volcano Cayambe emerged from its white blanket into the clear air and soft light of the stars and moon. In my tent, I listened to the unmistakable sounds of friendship on a cold, crisp night as creatures all around bedded down, or began to stir.